Are you stuck in a rut wishing you were doing something else in life? Have you ever wished that you had made a decision early in life to study the right course to lead to your dream career? Do you think that too many years have passed and it’s too late to follow that dream now? Well, think again. Like I have, these three fabulous women all took steps to follow their passion when they were in their 40s or later and I wanted to share their success with you. Friends Kate Walsh (artist), Julia Howells (jewellery designer) and Karlana Kasarik (author) are all now pursuing their dreams. Why now? Because throughout the years of other jobs, raising children and being involved in their communities in different ways, they never let go of those aspirations. With children in secondary school and less demand on their time from family, they took the opportunity to spend time on themselves, finally looking after their own needs, not just those of others. Today they are loving life, enjoying being creative and in the process making things for others that will live on and bring joy to friends, family and total strangers alike for years to come. Straight from school, Karlana studied a Bachelor of Arts (Criminology and Geography Hons) at the University of Melbourne and her first job was unexpectedly in computer programming and systems design with big city firms. Later, she was part of a restaurant management team. She dabbled in writing in her twenties but once Karlana started a family, there was no time for this. She also said it never occurred to her then that writing was something she could do, as while her degree was full of research and written assessment, she had never specifically studied how to write. Kate had a Bachelor of Education in arts and crafts and worked as secondary school teacher for a while. Once she had her kids, she managed to fit a little bit of painting into her life as well as teaching art part-time to both kids and adults. Many of Kate’s early paintings at the time were inspired by her kids and her mother-in-law’s peony farm. However, taking her art knowledge further by studying a Master of Fine Art was a mere dream. Julia was accepted into an RMIT sculpture course after Year 12, but she chose a Physical Education course instead. It was the fitness craze of the 80s time, but as Julia explained, “I could throw a ball and do lots of other sport (she had won the whole school prize for sportsmanship in Year 12) – I was just no good at aerobics!” She worked in the fitness industry for only 6 months and then in administrative roles in Ansett for several years. But her ‘arty side’ from school was still calling and in her early forties, while her kids were still young, she started experimenting and making necklaces from vintage broken china and beads. Fast forward to a few years ago. Karlana started writing again when her youngest child was 18 months old, and while she was unable to fit in study with four kids, she read a lot of books on writing, plot, character development and editing, and attended some short writing courses. She started to tell people she was writing a book. She has since published Books 1 and 2 of a fantasy-adventure trilogy for ages 10-13, a fabulous read for both boys and girls. She also visits primary schools to talk about writing and inspire the next generation of writers. In her early 40s, Kate was accepted by RMIT to do the Master of Fine Art course which she completed over two years part-time. It was a very fulfilling, artistically challenging course that pushed her boundaries and which she absolutely loved. The artistic friends that Kate gained made her experience even more enriching. 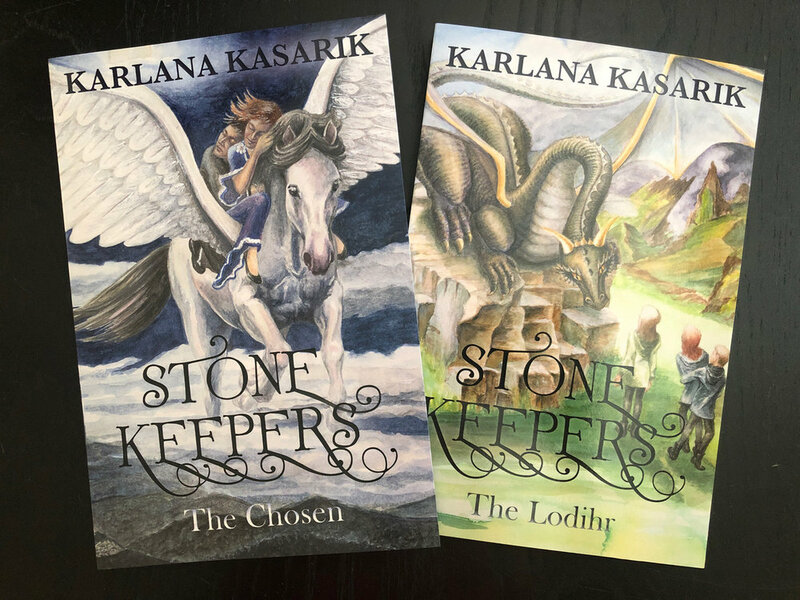 Since finishing, she has exhibited paintings annually, entered the many art prizes and completed many commissions, including the stunning covers of Karlana’s books. Teaching art is also a vital part of her life. In her late 40s, Julia completed a Certificate Two course in Jewellery Engineering and has focused on working with silver, incorporating her skill as a sculptor from all those years ago to make her unique designs. She is now focusing on engraving in silver and creating solid silver animals and other items based on her sculptures, including key rings and rings. Julia and Kate have invited 20+ creative like-minded people of all ages, including Karlana, to be part of a Pop-Up shop in Point Lonsdale, a beachside town two hours from Melbourne where both of them have connections. If you love art and beautifully crafted items and would like to meet these inspiring women (and explore the beautiful beaches at the same time), make a day of it and pop down to Ripper – Pop Up, Saturday April 13th through to Sunday April 21st, 9.30am - 5.30pm, 61 Point Lonsdale Road, Point Lonsdale. Check out the Ripper Pop Up Facebook page for more details. We hope this article inspires you to follow your dream career and love life like we do.